Stop in and see us in person at our headquarters based in thebeautiful in New Port Richey Fl. Contact our office now for all sale and support issues. We are here to help. Please email our team anytime for questions or concerns about your new ATM. Customer Services And Technical Support. How long will it take to receive parts that I've ordered? Warranty orders received by 3pm EST are shipped next day air. ATM signage and supplies normally are delivered within 5 to 10 business days. Who can I call for ATM service and warranty work? Service for your ATM is just a phone call away. Our experienced technicians may be able to solve your ATM problem over the phone. Simply call our technical support desk at (877) 696-7286 and we can arrange for replacement parts and, if necessary, call out one of our nationwide service technicians to repair your ATM. We have local technicians in every US State and Canadian Province. What should I do when a customer claims they did not receive the proper amount of cash from the ATM? The correct course of action would be to have the customer contact their financial institution directly to handle any reimbursement of funds. Have the customer keep their receipt, they will need to provide this information to their financial institution. Never give the customer monies from your store. The transaction will be taken care of by the ATM processor and the customer’s financial institution. The error message that the ATM reports is not listed in our guide what should we do? There are times when your ATM may have an error not listed in the guide. These errors are referred to as “undefined errors” and normally can be cleared by simply powering down the ATM and powering it up again. If the same error persists contact our technical support center at 888-696-7286 for further assistance. My ATM screen keeps reading Connecting to host, then goes out of service. What does this mean? This indicates that there is a problem with the phone line. There are a few things you should check to narrow down the problem. 1. Make sure the phone line coming out of the ATM is plugged into the phone jack in the wall. 2. Plug a normal phone into the phone jack and see if you get a dial tone. 3. If you get a dial tone, try dialing a number to see if the call connects properly. If all of these tests pass contact our technical support center at 888-696-7286 for further assistance. If you don’t get a dial tone or the call does not connect, contact your phone company to check the line. I need help opening the safe on my Hyosung or Genmega ATM. At the top of the dial ring, an index is provided for normal dialing and opening. This is a precision lock, therefore, extreme care must be used to align the combination number with the index. Turn the dial slowly and steadily. If after turning the correct number of revolutions, any number is turned beyond the index, the entire series of combination numbers must be re-dialed. DO NOT TURN BACK TO REGAIN A PROPER ALIGNMENT WITH THE NUMBERS. Each time a selected number is aligned with the opening index, a revolution is counted. 1. Turn the dial to the LEFT, stopping when “50” is aligned with the opening index, the FOURTH time. 2. Turn the dial to the RIGHT, stopping when “25” is aligned with the opening index, the THIRD time. 3. Turn the dial to the LEFT, stopping when “50” is aligned with the opening index, the SECOND time. 4. Turn the dial slowly to the RIGHT until the bolt retracts. To Lock 1. Turn dial to the LEFT at least four full revolutions. The three most important rules of real estate apply to the ATM business opportunity. It’s all about location, location and (of course) location. If you have poor positioning for your ATMs, you’ll probably not do much better than if you had them in your garage. So the first step is not only to find the machines, but to decide what you’re going to do with them once you have them. Some ATM manufacturing companies offer help finding locations, and some ATM franchise companies offer help finding the machines. Which way you start is merely a point of personal preference. If you choose a franchise, keep in mind that there are likely to be some franchise rules you’ll be expected to follow. The extent of these rules will depend on the franchise because there is no typical franchise contract. Each franchise parent company sets rules for themselves, and those decisions are up to the franchiser as long as they don’t violate any rules governing the use of ATM machines. Franchises do often offer one major benefit in the form of support. A franchise parent company may very well be able to train you in the management of your ATM business, down to bookkeeping and maintenance of machines. The reliability of your ATM machines will depend largely on your manufacturer – some are simply at the top of game in this sector while others aren’t. We highly recommend Genmega ATM, Hyosung ATM and Triton ATM. You may find that the cheapest source of ATM machines isn’t the best source. Here’s why reliability is such an important factor in your effort to start an ATM business. If a consumer is headed to an ATM machine, it’s probably because he or she needs cash. It may be for an impulse purchase or for an emergency car repair – but the fact remains that the person is looking for money. If your ATM machine isn’t working on that particular day (or worse, malfunctions mid-transaction), that person will probably be able to go to another ATM machine to get the cash they need. You’ve lost the profit from that particular transaction. But worse, you’ve probably lost future transactions because that person is going to remember your ATM as the one that didn’t work, and won’t even bother to stop there next time. The words “cashless” and “ATM machines” simply don’t seem to belong in the same sentence. After all, what service could a cashless ATM possibly offer? Actually, cashless scrip ATM machines are becoming more widely acceptable, and offer one of the most important things to the merchant – the potential for higher earnings. Take a look at the concept, how it works and how you can put it to work for you. In marketing, “soft benefits” is the term given to some benefit of shopping in a particular place. If you, as the merchant, can offer your transaction fee back to the customer, it might be just the slight incentive needed to encourage that customer to make a return visit. Even though the actual cash amount isn’t likely to be significant, you’re building good will – a feeling that will likely remain with the customer long past the moment when the last bit of wrapping paper is being crammed into the trash. Other benefits of cashless scrip ATM machines are evident in the environment. The customer will typically receive two receipts for the transaction, but other paper receipts are eliminated. The result is less need for paper and less paper to throw in the trash – both good ideas for the environment. Finally, you can point out the ultimate convenience of this type of transaction. Checkouts are faster because your customers aren’t standing in line writing checks. Approval is almost instant and there’s no need to make change. If you, as a merchant, are able to offer the very cutting edge of technology as a means to convenient shopping, your customers are going to remember you. If you’re considering setting up an ATM or adding to your existing network of ATMs, you have to ask yourself a couple of questions. What is it that makes ATM machines profitable? What can cut down those profits? What can you offer that will make people pass up some other ATM to choose your GENMEGA ATM machines? One of the innovations that emerged from GENMEGA ATM is the combination ATM and ticketing kiosk. Just consider the problem some people face at movie theaters. It’s not until they arrive that they realize that they don’t have enough cash for movie tickets. They may very well scramble around to find an ATM machine, or they may simply go to a video store that will accept their credit or debit card and take their evening’s entertainment home – unless you can make it easy to overcome this problem. If you think service of your ATM machine is important, you’re right. Hyosung recognizes both that service is sometimes required and that you may prefer your own service technician over Hyosung service providers. If that’s the case, you can quickly order and track parts through the company’s website. Just choose the parts you need and place your order. If you wonder where the part is, when it was mailed or when it’s due to arrive to you, just go back to the website and check the status of the part. It’s all designed to help your business be as profitable as possible. Security is always an issue and Hyosung ATM machines have been at the cutting edge of technology for many years with security-minded machines. After creating the technology designed to deter would-be robbers, Hyosung moved right on to offer the first dial-up ATM available to the general public. These ATM machines are also very compact so that they’ll fit in the smallest imaginable space, all aimed at what the company calls “low cost, high reliability” technology. When you consider Hyosung ‘s commitment to developing new ideas, you can probably imagine yourself as part of this winning team. This company is based in California and produces a variety of self-service machines, such as ATMs. Where can I order supplies for my ATM? My ATM has an error message on the screen. What does this error message refer to? The next question is how much will your new ATM machine cost. This question is a little harder to answer simply because there are so many ATM machines to choose from. 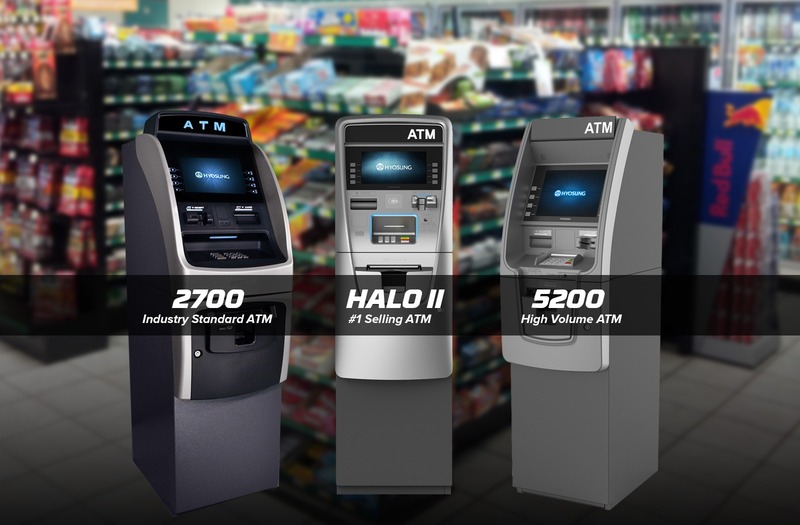 Such as Class 1 Armored ATM machines, Indoor ATM machines like the Hyosung Halo ATM, Triton Traverse ATM – Triton Argo ATM, Genmega 2500, Genmega Through-The-Wall ATM machines, Cashless Scrip ATM, etc. But one thing I can tell you is that 75% of the ATM machines used in non-bank locations are non-armored ATM machines. A good non-armored ATM machine is the Gegmega 2500 ATM machine. The Triton 9100 ATM or the Gegmega 2500 can be purchased from us at A VERY LOW COST. The price for the Gegmega 2500 should range between $2,095 and $2,750 depending on what options you choose. Coming soon, we will have an online error guide that will give you a description and a corrective action to your error codes. My ATM says its out of service but there is no error message on the screen. What should I do? Many times the error code is only visible while you’re in the “Operator Function” menu. When you enter the “Operator Function” menu the error will be displayed in the center of the screen. I just replaced the receipt paper roll in the ATM, but all of the receipts are blank. What should I do? The receipt printer in your Hyosung or Genmega ATM is a thermal printer and will only print on one side of the paper. You can probably solve this by simply reversing the paper and re-feeding the paper back into the printer. What is the procedure for stocking cash in my Hyosung or Genmega ATM? 1. From the “Welcome Screen”, press the CLEAR, CANCEL and ENTER keys simultaneously. Then press the 1, 2 and 3 keys in order. 3. At the “Operator Function” menu, select “Settlement”. 4. At the “Settlement” menu, select “Cassette Total”. The “Cassette Total” info will be printed from the Receipt Printer. Save this receipt and compare to your cassette figures. Note: A “Cassette Total” resets the cassette figures back to zero. 5. Open safe and remove cassette. Count money in cassette and in reject bin. Compare this total to the “Cassette Total”. Record the amount of cash in cassette. 6. Add new cash to cassette along with the old cash. Record the total amount of bills in cassette (old bills and new bills). 7. At the “Settlement Menu” select “Add Cassette”. 8. Enter in the total amount of bills in cassette then press ENTER. Note: The window in the middle of the screen should read “Current # of bills =”. Make sure that the # is correct. 9. At the “Settlement” menu, select “Trial Cassette Total”. This will print out a receipt and it will show the new amounts in the cassette. Press ENTER. Note: Make sure you perform a “Trial Cassette Total” and not a “Cassette Total” at this time. A “Cassette Total” will reset the #’s back to zero, causing the machine to go out of service. 10. Press CANCEL until you get back to the “Welcome Screen”. 11. Verify that machine has an adequate amount of receipt paper left. 12. Please call us at 877-696-7286 if there are any supplies needed, or if you have any problems during the replenishment.